Things change when you become a mom. You no longer get eight or nine hours of uninterrupted sleep. 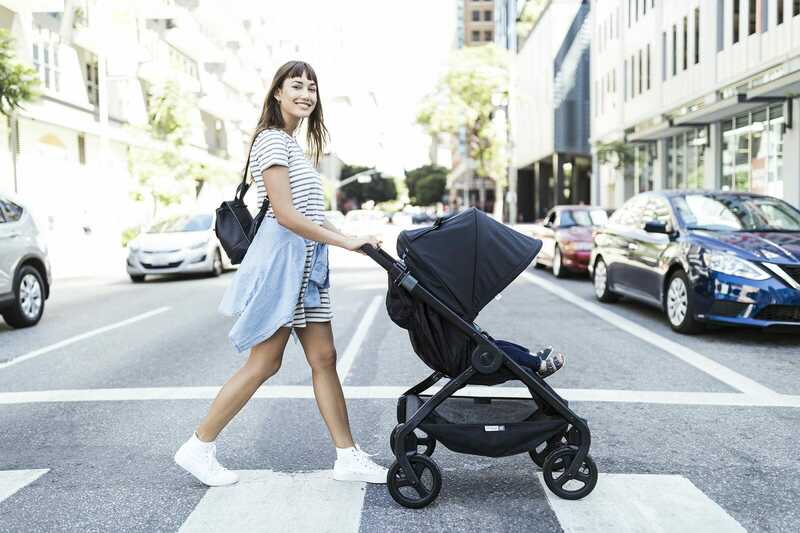 Your exercise goes from daily gym visits to pushing your reversible stroller to the park and chasing a toddler around. Your style and time to get ready also change. And in between making breakfast and making sure your kids brush their teeth before school, there just isn’t a dedicated hour to get ready every morning. Or sometimes you feel like you can’t even get 10 minutes to drink your coffee and scroll Instagram in peace. But, that doesn’t mean you still can’t have a little “me” time throughout the day. Here are 10 daily self-care mom hacks to help you look and feel good from morning until night. Showering when my kids are awake either doesn’t happen or is me rushing to shower while my little ones take turns turning the tub water on and off (goodbye water pressure) or pound on the shower door. Showers should be enjoyed. So if you want to start enjoying long, hot, interrupted showers again, and actually get to take one each day, take one at night after the kids are asleep. And if you’re feeling really motivated, blow dry and do your hair so it’s ready to go when you wake up. 2. Lay your clothes out the night before. After your shower, take a few minutes to pick out your outfit for the next day. It’s totally acceptable to run errands in sweats and a t-shirt, but I know at least for me that I feel more put together when I actually get dressed for the day. Now, that doesn’t mean I can’t be comfy and cute. When I want to feel feminine and put together, I throw on some jeans and a cute V-neck or leggings and a tunic. So choose your outfit the night before and lay it out so that you’ll be dressed and ready to go in two minutes come Monday morning when you’ve overslept and forgot your daughter has to be at school early for volleyball practice. 3. Wake up 10 minutes earlier. I’m not a morning person, so I feel kind of bad telling moms you need to do this. But, I can attest that when I have woken up earlier than the rest of my family, whether it was to exercise or have my morning shake and read a chapter of a book, the rest of my day went so much better. This alone time is the perfect jump-start to starting a daily self-care routine. Start out waking up five or 10 minutes earlier, and then who knows, you may work up to 30 minutes or an hour of free time—and you may actually start enjoying your mornings. 4. Work self-care into a morning routine that works for your family. Mornings with kids are chaotic, whether you have one or five. De-stress your mornings with a morning routine that includes some self-care. That might mean doing squats and lunges in the kitchen while your kids eat breakfast or going into your toddler’s playroom after he wakes up so he can safely play and you can spend 10 minutes to get in the right mindset for the day and maybe check some work emails. Test out different routines until you find one that works and you feel good about. 5. Keep a small makeup bag in your purse (or diaper bag). Who honestly has 20-30 minutes to put on a full face of makeup every morning? Or better question, who really wants to when you could sleep instead? But, sometimes a little attention to yourself can make you feel like you’re ready to face the day. You don’t need half an hour to look put together; you only need a few minutes and four products: BB cream, mascara, blush and lipstick. 6. Maintain a low-maintenance hairstyle. Rid yourself of bad hair days with a low-maintenance hairstyle, meaning one that dries quickly, maintains its shape after sleeping on it and is easy to style. There are different styles for different face shapes and wanted lengths, from a pixie cut to a shoulder-length lob, that look fabulous and are easy to style. I also recommend keeping bottles of dry shampoo and texture spray on hand. There’s no time (or need) to wash your hair every day. And with dry shampoo and texture spray, you don’t need to. These hair products hide your oily spots, give your slept-on flat hair some volume and make that blowout last another day. 7. Take advantage of naptime. Naptime is the perfect time for a little self-love. If you’re in the glorious days of multiple two-hour naps, you can do so much for yourself, like make a snack you don’t have to share and eat it while you watch a show, paint your nails, work on a craft or take a nap yourself! Even if your child takes a shorter nap or takes multiple short naps, you can still fit in much-needed self-love time during your child-free breaks throughout the day. 8. Take a one-hour lunch if you’re a working mama. No one deserves some “me” time more than working moms. As one myself, trying to balance the demands of my family and work is hard and pretty stressful. If you can, take a long lunch, whether you work in an office or from home. And spend that time doing more than just eating in peace. Call a friend. Write in your journal. Take a walk. Even if you only get a 30-minute lunch, you can squeeze in time to do something for you to help you de-stress from your demanding day. 9. Work five minutes of self-care into your kid’s bedtime routine. Just like in the morning, find time during the bedtime routine to do something for you. Put on a face mask while your kid plays in the tub. If your significant other is home, have him put the kids in their pajamas and brush their teeth so you have a moment to sit quietly in your chair and meditate for a few mintues (or let’s be real, eat a cookie). You work hard every day. You do so much for your family—so never, never feel bad about taking time throughout the day to focus on you. You need to care for yourself just like you care for everyone and everything around you. You can only pour from a full cup. So be kind to yourself; push that mom guilt out of your head when you practice these self-care tips.